Last week I attempted to visualize world embassies to the United Nations in New York as a social network. 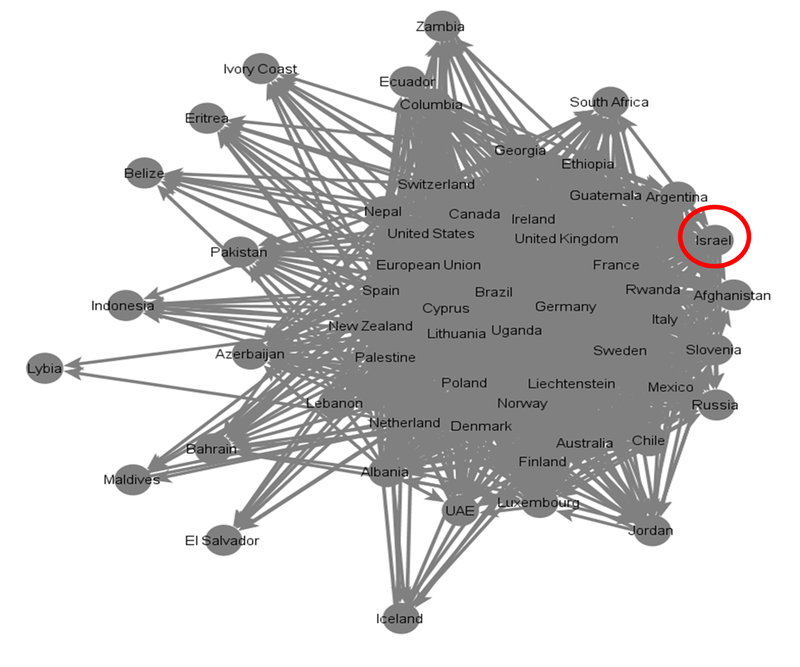 Using a sample consisting of the twitter accounts of 56 embassies to the UN, my analysis explored which embassies are the most popular in this network, which embassies are most connected to other embassies and which embassies serve as important hubs of information within this network. 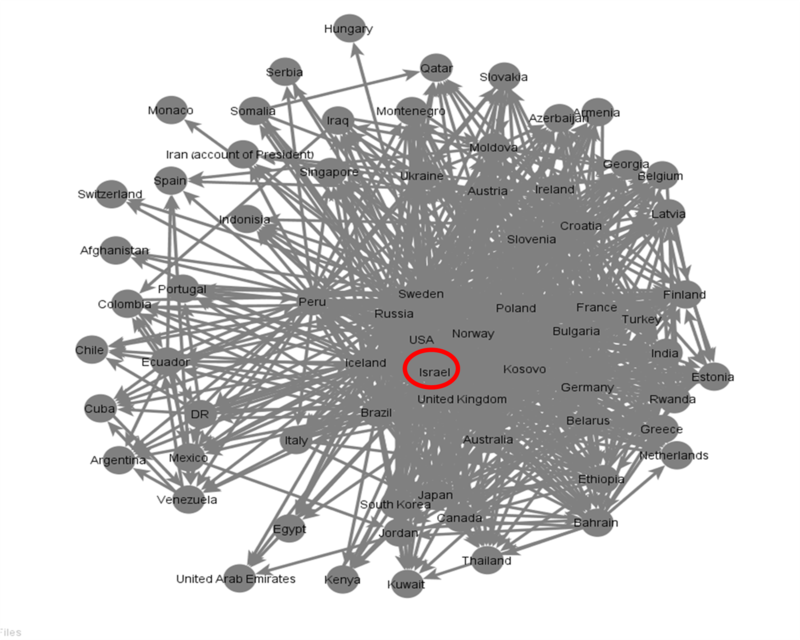 While the analysis yielded interesting results, I was somewhat surprised by the fact that Israel’s mission to the United Nations was located at the periphery of this network (as can be seen by the image below). I therefore decided to take a closer look at the twitter account of Israel’s mission to the UN and draw a more detailed profile of its twitter account. Israel’s mission to the UN is followed by 26 other embassies out of a possible 56 embassies included in this sample. This places it slightly above the average of 25. However, it is the identity of the embassies that follow Israel’s mission that warrants further attention. First, Israel is followed by six of the G-7 nations whose UN embassies have twitter accounts (US, Canada, Germany, United Kingdom, France and the European Union). This finding indicates that the Israel’s mission has the ability to effectively disseminate information to, and engage with, some of world’s most influential nations. Secondly, with regard to UN institutions, eleven embassies of the fifteen nations currently comprising the UN Security Council have twitter accounts. Of these eleven, seven follow Israel’s mission to the UN including three members with veto rights (US, United Kingdom, France, Argentina, Chile, Jordan and Lithuania). The only embassy with veto rights that does not follow Israel is Russia, which according to my analysis follows only two other embassies. This finding could indicates that Israel’s mission to the UN is strategically able to influence decisions reacted in the UN’s holy of holies. Thirdly, Israel is followed by seven of the ten most popular embassies in the UN social network. This is an important finding as it translates into a large potential audience and global reach since embassies to the UN may re-tweet one another. Even more importantly, Israel’s mission is followed by nine of the ten countries which serve as important hubs of information within the UN social network (US, European Union, Spain, New Zealand, Switzerland, Cyprus, Lithuania, Germany, Poland and Netherlands). This again potentially increases the mission’s ability to disseminate foreign policy messages throughout the entire network. However, as it is not an information hub by its own right, Israel’s mission is forced to rely on “the kindness of strangers”. Israel’s mission currently follows 29 other UN embassies in this sample which places it well above the average of 24. But this is not the only parameter in which the mission’s activity is above the average. In terms of total tweets published thus far by UN embassies, Israel’s mission is one of the ten most active UN embassies in this sample ranked at number six (as can be seen in the image below). As online activity on social networking sites leads to a large number of followers, it is not surprising that Israel’s mission is also one of the ten most popular UN embassies in terms of overall number of followers (as can be seen in the image below). Finally, the UN social network is characterized by the fact that neighboring countries often follow one another (e.g., African countries, European countries). This is not the case with the Middle East. There are seven Middle Eastern countries represented in this sample (Israel, Palestine, Jordan, United Arab Emirates, Lebanon, Bahrain and Libya). Of these seven, Israel’s mission follows only three (Palestine, Jordan and the United Arab Emirates) while only Jordan follows Israel’s mission to the UN. Although these findings may represent political decisions they also hinder the mission’s ability to gather important information regarding the diplomatic activity of its neighbors and vice versa. In summary, although Israel’s mission is not at the core of the UN social network, it is in a strategic position with regard to UN institutions and, more importantly, it is one of the ten most active and popular embassies to the UN. Posted in Uncategorized and tagged Digital Diplomacy, Israel, Israel mission to the United Nations, twiplomacy, Twitter, united nations. Bookmark the permalink.